From October 2013 to October 2014, I took a sabbatical—a break from the daily grind of work to figure out what I wanted to do and where I wanted to do it. I took many continuing education courses and attended diverse lectures. And I practiced a lot of yoga. I watched and thought to myself that many of these movements are rooted in yoga. They were using yoga for strength and conditioning! I wanted to learn more about the origin of these movements that we were using on a day-to-day basis in our weight room and therapy clinics, so I decided to do my 200-hour yoga teacher training. The word yoga conjures up many different images for many different people. Some think yoga is simply a form of exercise. Others associate it with religious practice. Still others believe yoga to be a form of relaxation. So, what is yoga, and how does it relate to our physical therapy practice? 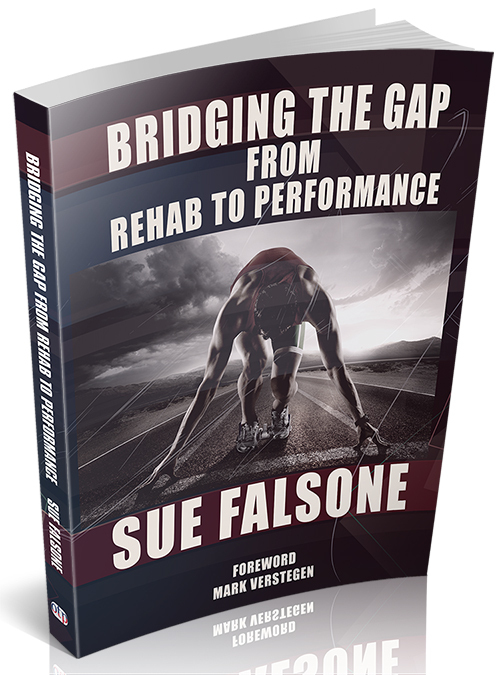 If you prefer to listen, click for Sue Falsone’s expanded Yoga for Strength talk. The Indian sage Patanjali is believed to have collated the practice of yoga into the Yoga Sutra an estimated 2,000 years ago. The Sutra is a collection of 195 statements that serves as a philosophical guidebook for most of the yoga that is practiced today. Yoga can be many things to many people. In regards to our physical therapy practice, we can use the principles of yoga to help realign the body, increase strength, flexibility and balance, and help with coordinating our breath with movement. Yoga originated in India well over 5,000 years ago, but was only introduced into the United States around the 1930s, when yoga masters began to travel west. In the 1960s, doctors often prescribed yoga as a form of stress management. Presently, yoga is used for a variety of reasons; the principles of yoga can help a patient with strength, stability, balance, flexibility, body control, mental control, relaxation, awareness of breath, and stress management via meditation. A practitioner or a patient may choose to use yoga for one, some or all of these reasons. Everyone’s journey is different, and everyone’s needs are met differently based on their personal circumstances. Many misconceptions surround yoga. There is a common misbelief that yoga is derived from Hinduism. Therefore, many people who do not practice Hinduism are apprehensive of yoga, as they do not want yoga to interfere with their own personal belief system and religion. This is a complete misunderstanding. In fact, yoga pre-dates Hinduism by many centuries, demonstrating that many religions have adopted principles of yoga, not the other way around. Yoga is not a religion. It has no creed, no fixed set of beliefs and no god-like figure to worship. Practitioners of yoga follow many different religions and belief systems without any conflict, internally or externally. Yoga has also come to be associated with veganism or vegetarianism. You do not need to eat a certain way in order to reap the benefits of yoga. Many meat-eating people realize the many benefits of a consistent yoga practice. Yoga can be intimidating to some. People in the classes can seem like they stepped off of a Cirque du Soleil stage. Yoga instructors use Sanskrit words that are unfamiliar, as Sanskrit is a dead language (remember Latin is also a dead language, yet we use it all the time when discussing anatomy and medical terminology). The poses are hard and people may feel like they look silly doing the poses, so they don’t go. Keep this in mind moving forward: true yoga dispels all of those myths, concerns and insecurities. You also do not need to go to a studio to practice yoga. There are many podcasts, e-books and websites that do a great job of guiding you through a personal practice right in your living room, negating the need for you to compare yourself to those around you. Look around. The Yamas (restraints) – these are the “don’ts” in life. The Yamas are generally the moral, ethical and societal guidelines, which are fundamental to a yoga practice, and quite frankly, to leading a good life. The Niyamas (observances) – these are the “dos” in life. The Niyamas are a contract with oneself for habits of healthy living. The Asanas (postures) – these are the postures or poses that are typically performed during a yoga class. These poses are often what get people interested in yoga, but this is only one-eighth of what yoga truly is about. Pranayama (breathing) – this is the breath. As a discipline, we are currently exploring the breath and how it is related to everything from stress management, pain management, movement, mobility and stability. The breath is so important in yoga, and is emphasized with every movement as well as every bit of stillness. Pratyahara (withdrawal of senses) – this is the control or withdrawal of the senses. This practice leads us to a state of profound relaxation, self-awareness and inner stability. Dharana (concentration) – this is the concentration on cultivating inner perceptual awareness and having a concentrated single focus. Dhyana (meditation) – the devotion and meditation on the divine. Samadhi (absorption) – the union with the divine, or ultimate enlightenment. As we explore these eight limbs, we begin by refining our behavior in the outer world, and then we focus inwardly until we reach samadhi (liberation, enlightenment). The last four limbs of yoga certainly can be reserved for those who are looking to deepen their practice and take their yoga to the next level, so to speak. However, the first four limbs are extremely applicable to the person without a day of yoga experience. The first two limbs, the yamas and the niyamas are just simply good rules to follow if you want to be a good person in life and a contributing member of society. The yamas discuss things such as living a non-harming life, living a truthful life, not stealing from one another, not wasting your energy on instant gratification, and not coveting what others have. The niyamas discuss cleanliness of ourselves and our surroundings, contentment for what we have and where we are in life, self-study and self-awareness, and surrendering to something higher than oneself. Whether you follow a certain religion or don’t follow any religion at all, most of us can agree that these are good, general rules to live by. Look familiar? It is an unloaded single leg RDL. I dare say most of use a single-leg RDL with one of our clients on a weekly, if not daily, basis. How about tadasana? Clinicians, have you every discussed good posture in standing with a patient? Then you have instructed them in tadasana. Finally, there is pranayama. Those of you have read any of my work know that I am fascinated with breath as a therapeutic exercise. You can only imagine my delight when I was going along my yoga journey, only to find that there is an entire limb dedicated to breath. Breath has become an area of interest for many clinicians and performance specialists over the last several years. We need to recognize these are not new concepts. We are simply repackaging things in a way that resonate with today’s client and today’s practitioners. You can see how I have packaged some of these concepts for my athletes in my video on the Cervical Thoracic Junction. The word bandha (pronounced bun-da) means, “to hold, tighten, or lock.” There are three bandhas in yoga. The first is Mula Bandha, or root lock. It is with mula bandha that we draw energy through our perianal muscles, tightening the pelvic floor. We already perform mula bandha in our general physical therapy practice every time we teach kegels to a patient. We teach kegels (or we should be talking about them) with just about every type of low back pain patient. It is difficult to address back pain and the core without addressing the pelvic floor, no matter what type of patient population you are working with. The second bandha is Uddiyana Bandha, or abdominal lock. Here we draw energy through the abdominals by tightening them, just like we do with abdominal drawing-in. This concept has changed over time. Although uddiyana bandha was originally discussed as a drawing-in, we have new research that shows us this might not be the best way to use our abs to help stabilize our spine. Abdominal bracing has become a more acceptable way to think, thanks to the plethora of research from Stu McGill. We can use science to guide and progress our traditional thought. That is the beauty of modern medicine. The final bandha is Jalandhara Bandha, or chin lock. We teach this daily with our upper-quarter patients, any time we perform axial cervical extension, or activate the deep neck flexors. Vladimir Janda discussed these concepts in the mid 1990’s, demonstrating that the deep neck flexors are consistently inhibited. Jalandhara bandha activates these deep neck flexors that Janda brought to light in the modern western world. The three bandhas significantly influence the ability to hold the asanas, or postures. We teach them daily to our patients to help facility stability at the pelvis, abdomen and cervical spine. You are teaching yoga and didn’t even know it. Vinyasa yoga focuses on connecting movement with the breath. For every movement, there is a correlated inhale or exhale which can either open or deepen a movement. It is more of a fast paced practice, moving into and out of postures, and often found in the fitness realm. Yin yoga is more of a meditative, passive practice, relaxing into different poses, creating a deep stretch on the tendon, fascia, and soft tissues of the body. Postures can be held anywhere from 3-20 minutes. Restorative yoga frequently uses props such as bolsters, straps and blankets to support different postures for a period of time. You move slowly through the postures, centering your breath and body. Bikram yoga is a 90 minute, fast paced practice that builds strength and flexibility. The 26 postures are the same for each class, and are performed in a heated room of about 105 degrees F.
Ashtanga yoga involves synchronizing the breath with a progressive series of postures producing intense internal heat and a profuse, purifying sweat that detoxifies muscles and organs. The practice is very progressive, not allowing or encouraging a student to go past a pose he or she is struggling with. Each pose is performed to prep for the next pose or the next level of the pose. Iyengar yoga is all about precise alignment and purposeful sequencing. The use of props are helpful to attain the best alignment of the body. How long have you been in this field? How many fads have you seen come and go? How many of the things that we do on a daily basis won’t stand the test of time? Yoga has stood the test of time. Five thousand years is a pretty good run, and I don’t see it going away any time soon. I’m just getting started . . . for those interested, there’s more information in my new talk of the same name Yoga for Strength. Has this article interested you in exploring flexibility and stretching? If so, take a look at Charlie Weingroff’s The Stretching Code.